The starkly beautiful Jebel Saghro range of mountains continues the line of the Anti Atlas, rising between the High Atlas and Dades valley to the north, with the Sahara stretching away to the south. little-visited and entirely undeveloped for the tourist market, it offers a landscape of flat-topped mesas, deep gorges and twisted volcanic pinnacles softened by date palms and almond groves. It’s wild, arid, isolated nomad country. The great warriors of the south were the Ait Atta people of this region, and their last stand against the French took place here, on Jebel Bou Gafer. 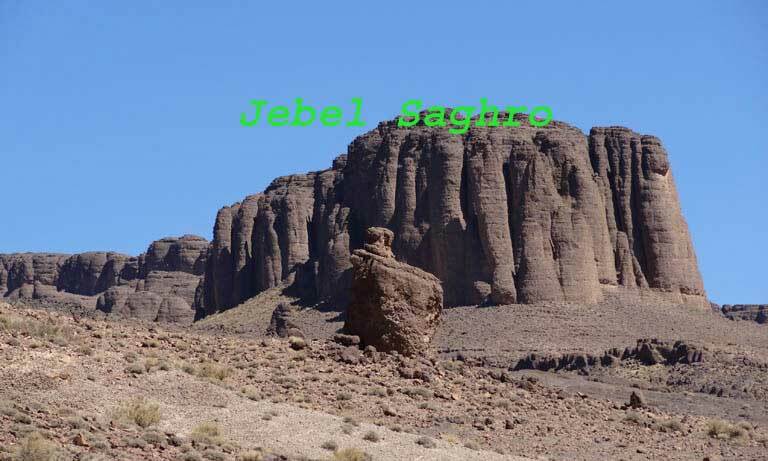 Jebel Saghro trek could take anything from 5 to 12 days, and choices are endless. A few highlights do stand out. First on most people’s list is Bab n’Ali, a fantastic area of rock pinnacles and weird geological formations. The Tête de Chamaux ( head of the camel) cliffs, above Igli, are also impressive, as is the Taggourt Plateau. There are many other plateaus, rock formations, and peaks to Explore.